We set off on Beijing’s third ring road, only slightly congested in the pre-rush hour, steam rising up from the cars in the crisp winter morning. 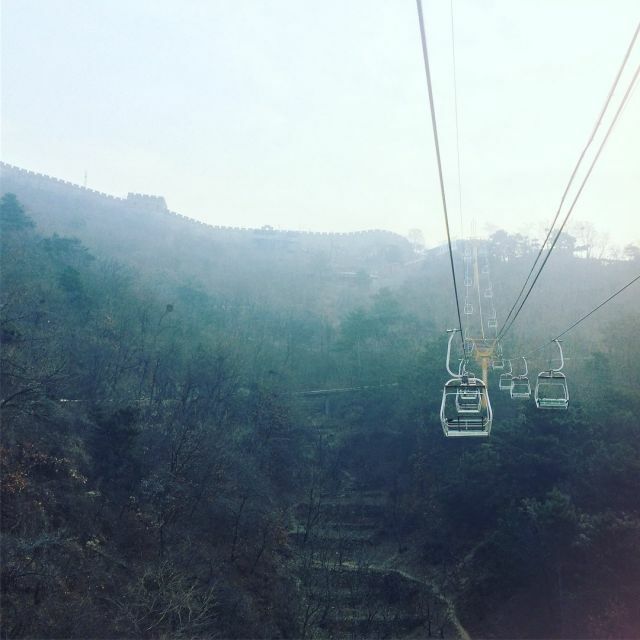 Dry, chill, wintry weather cast in pale colors frames our experience in Beijing. We enjoy the contrast but lament our chapped lips and skin. The city roads open onto empty motorway, and I fall promptly asleep, the lure of the comfortable seat too great. 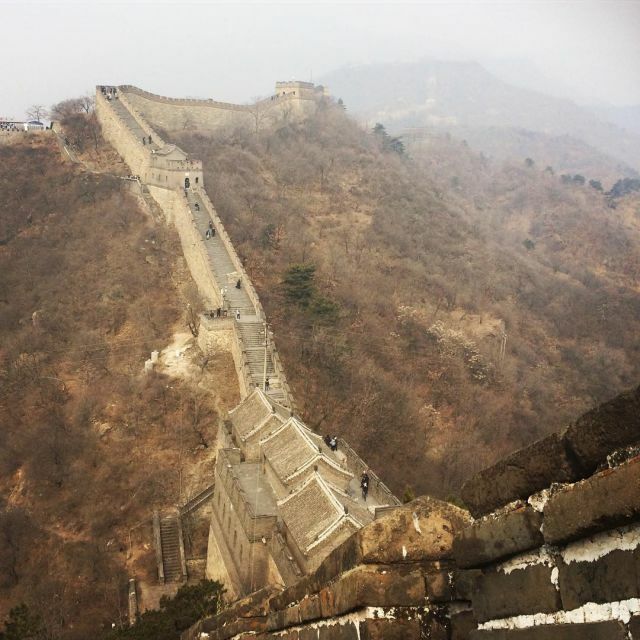 I’d read online that the drive would take over two hours, but the lack of traffic and setting off from the north part of city cause me to jolt awake an hour later as we park near to the Great Wall ticket office at the Mutianyu section of the Wall. We’ve opted for one of the most popular sections for our first visit. 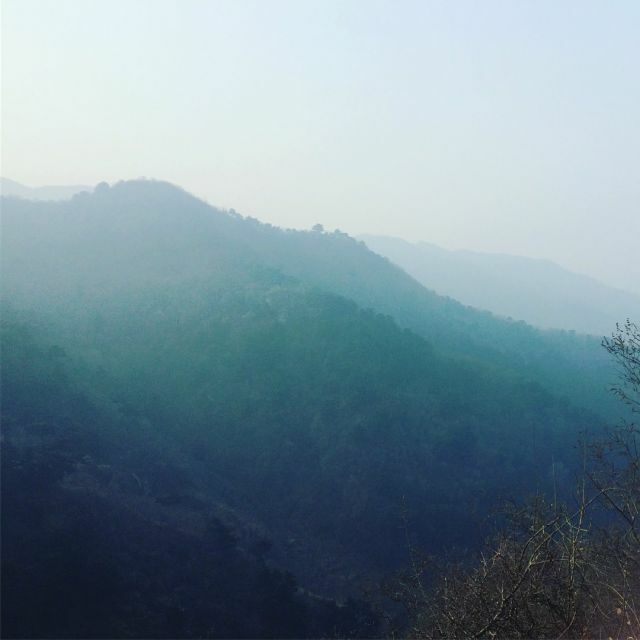 Though there are other fascinating sections to hike and explore, we’ve heard that Mutianyu is equally epic and not so far from Beijing. 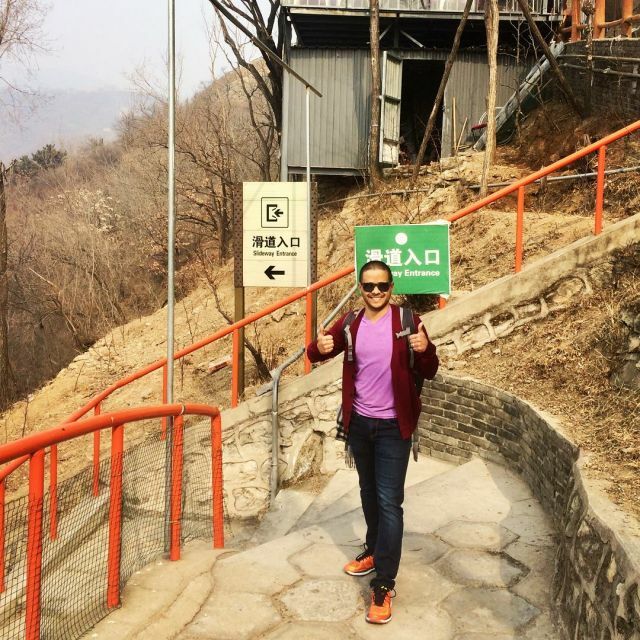 There are a few options to ascend to the Wall: hike, enclosed cable car, or ski-lift-like gondola. The return journey promises a toboggan ride down a winding slide. 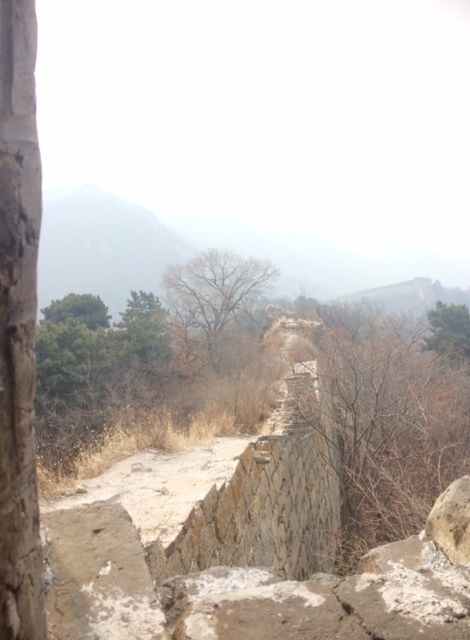 Of course, I inform Amaury that these are the traditional ways soldiers in Qing Dynasty scaled the steep slopes to the wall. John takes us to get our tickets and waves us towards the gondola over the cable car. Though a bit apprehensive, we take our tickets and say goodbye to our guide who promises to pick us up at noon. In the early morning mist and hint of air pollution, the distant wall, just visible on the winding hills above us, is cast in an ethereal light. We board a large shuttle bus complete with a video in English describing the building and use of the Wall. At this point, the ski lift and anticipated toboggan ride make it hard to picture it as a serious fortification against the invading Huns. Yet, a thrill runs through me as we get off ten minutes later and see more of it above us, cutting into the hills. As we walk up, gondola tickets grasped firmly in gloved hands, the Wall becomes more and more solid. We are really here. 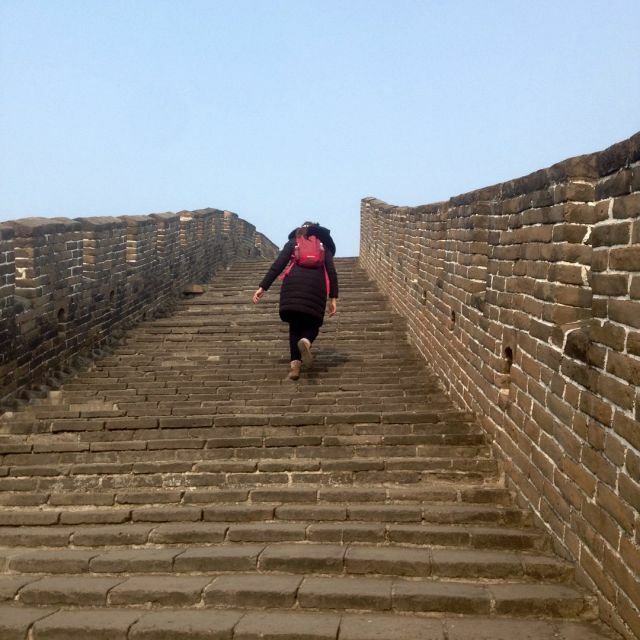 I cannot quite believe my luck, all the decisions, flights, steps, moments that have brought me to a place I’ve always wanted to visit and never, until moving to China, thought I would. 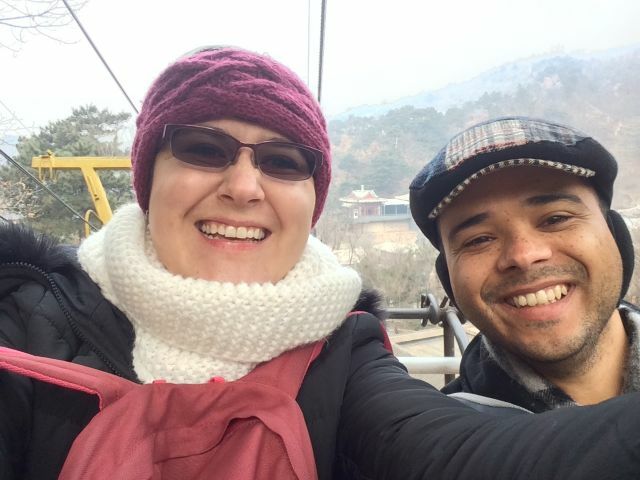 On the swaying gondola, a million or so feet above the hard-packed earth, scrubby bushes, and bare trees below, we take a funny photo of us gritting our teeth in forced smiles, exhilarated and terrified by being on a Chinese ski-lift. The distant cable car rising up to another point on the wall looks enticing and tame; we are glad we took the more memorable ride up. At last! 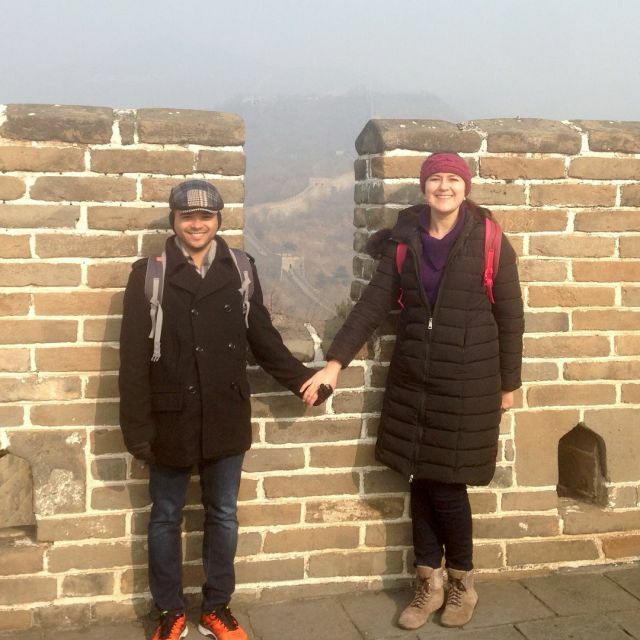 We walk a short distance past tourist information booths and carts selling miscellaneous over-priced drinks and then we are there, on the Great Wall. A few weeks later it will be covered by a sudden snow, but today the stones are dry- cold to the touch in the shade, warm in the sun. We enter a guard tower and climb up a steep, metal ladder that opens to a dazzling view of the surrounding countryside. Thinking back to college history textbooks, I try to imagine the thousands of workers building the Wall through back-breaking work that packs their blood and bones into the foundations; the invading Huns racing across the distant empty landscape; the sentries in the guard towers and along the ramparts aiming through the small holes carved through the stone. 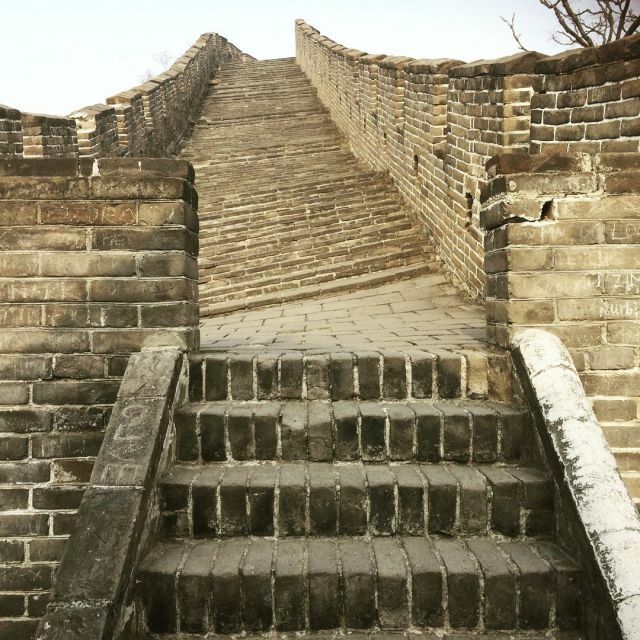 I also spend a lot of time thinking about how steep the steps are, and why does it have to go up and down so much. 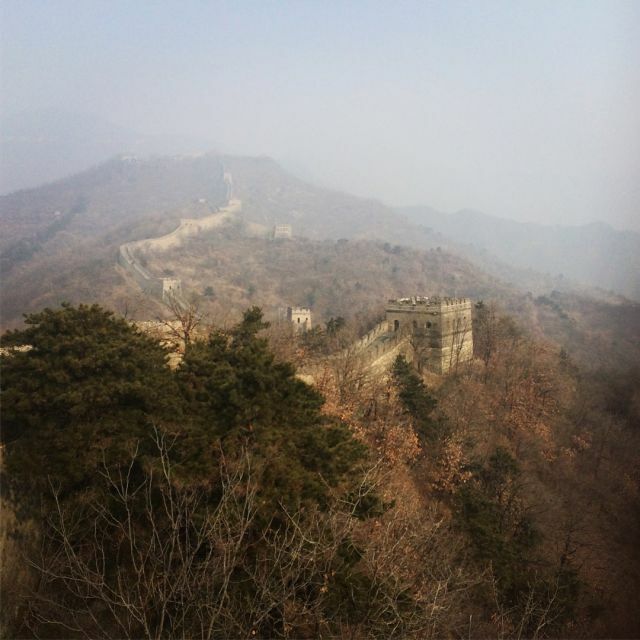 The Great Wall is definitely a hike. After a walk punctuated by picture taking and marveling, we head back to the first guard tower we entered towards a particularly steep section of the Wall that has larger buildings that were once storehouses and meeting rooms. We crane our necks up towards an uppermost tower that is perched on the top of a stack of large stone steps, some of which are a foot and a half tall, that resembles a sheer wall rather than a walkway. Gritting our teeth, taking a deep breath, and peeling off our outer coats, we painstakingly clamber up, using our hands in places to pull ourselves upwards to what promises to be a stellar view. Eighty-year old men with walking sticks (Amaury says they were hiking sticks, but my addled perspective from heaving myself bodily up a cliffside swears that they are walking sticks of the type eighty-year-olds are wont to use) make their way down beside us, giving me both confidence and shame as I scrabble around. Much exertion and several short breaks to calm my beating heart later and we are at the top. The inside of the uppermost guard tower is refreshing, the inside cool and dark. I peer out through its gaping windows, square holes framing the sight of unreconstructed sections of the Wall curving off into the distance. Here, untamed and toppled, the Wall feels more real and, somehow, despite its shabby appearance, more beautiful. A few pictures and awe-filled sitting and then we set off back down the steep steps, our knees protesting but our hearts light. We walk past the gondola entrance to the head of the toboggan slide. John tells us later that a few years ago there were no checks on speed or signs warning tourists to slow down. He used to hike up to the top of the wall and whizz back down at breakneck speed. 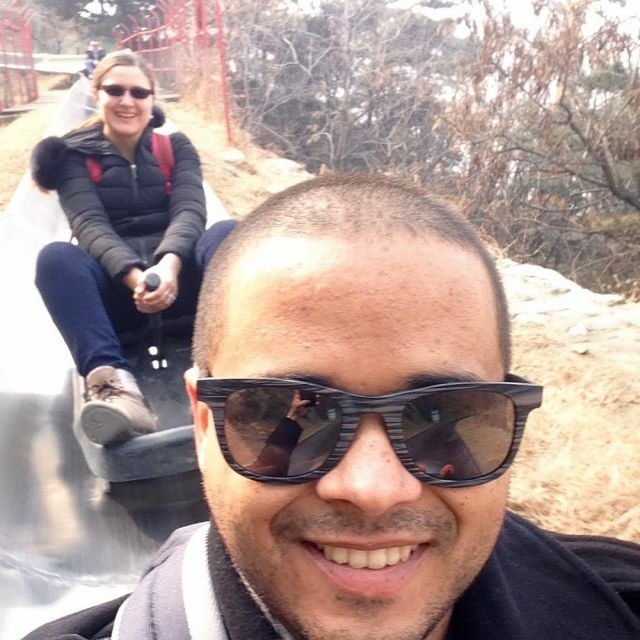 Now, the slide automatically slows us down at the most thrilling turns and steep sections, but we still thoroughly enjoy the experience of sliding down from the Great Wall of China. I’m sure Ming Dynasty emperors are rolling in their graves. John meets us back at the car and drives us a short distance to a local restaurant where we stuff our growling bellies with spicy green beans, egg drop soup, grilled eggplant, and sweet and sour pork. He shares that he’s been driving people from many different countries to the Wall on a daily basis for twenty years. Every few minutes he darts up from the table to track down the fuwuyuan (waiters) to find out where our food is, order dishes to go, and get more hot water to drink. Bubbling energy, he both delights and exhausts us. We fall promptly asleep again on the hour-long drive back, content that we can finally say we’ve truly been to China. 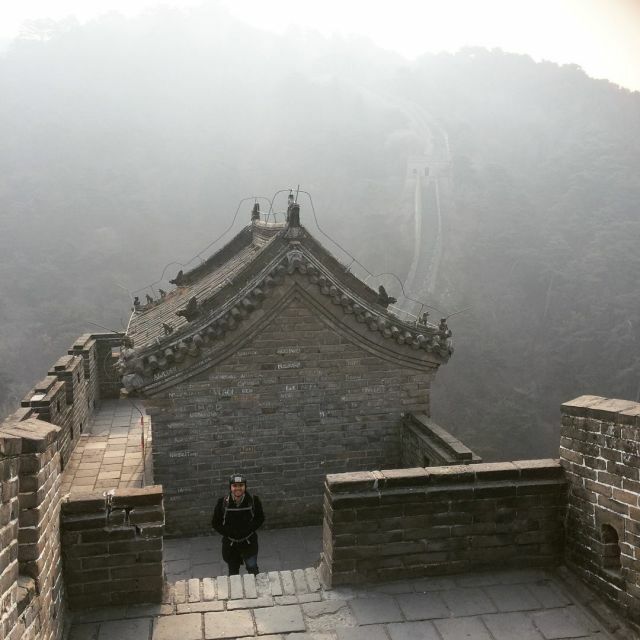 After all, you can’t come all this way and not see its Great Wall.